Royal Enfield, over the past few years, has turned into a cult brand, upping its game with new products and an aggressive marketing strategy. This concerted effort at reinvigorating the once-staid manufacturer has paid off well, with various Royal Enfield motorcycles gracing the screen in several Bollywood flicks, garnering the brand more valuable attention in a country that almost worships its movie industry. But what about RE’s older motorcycles? We have been bringing you several mod-jobs and here is one more addition to the list. 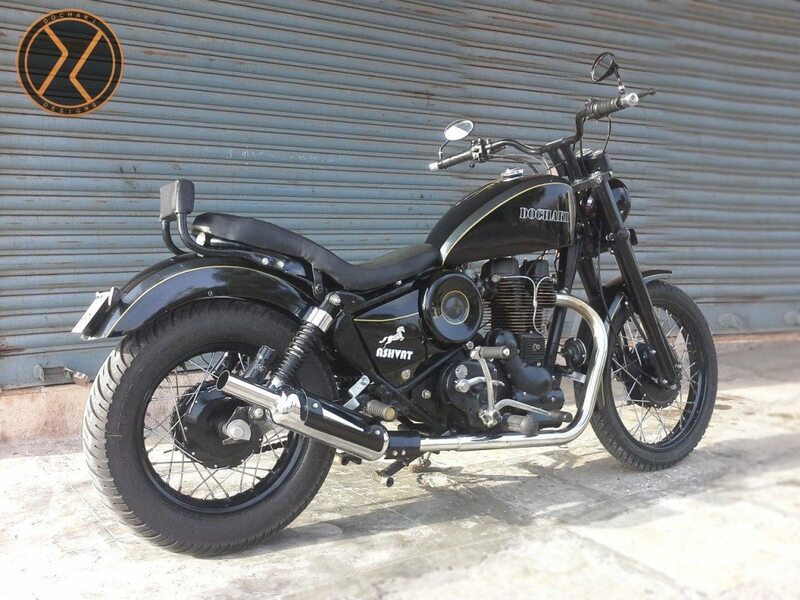 Pune based custom two-wheeler builder Dochaki Designs is back with yet another mod-job based on a Royal Enfield motorcycle. This time around, the artists at Dochaki Designs have used a 535 cc Royal Enfield Lightning motorcycle as the base model to design this custom made low-riding cruiser, tagged as Ashvat. 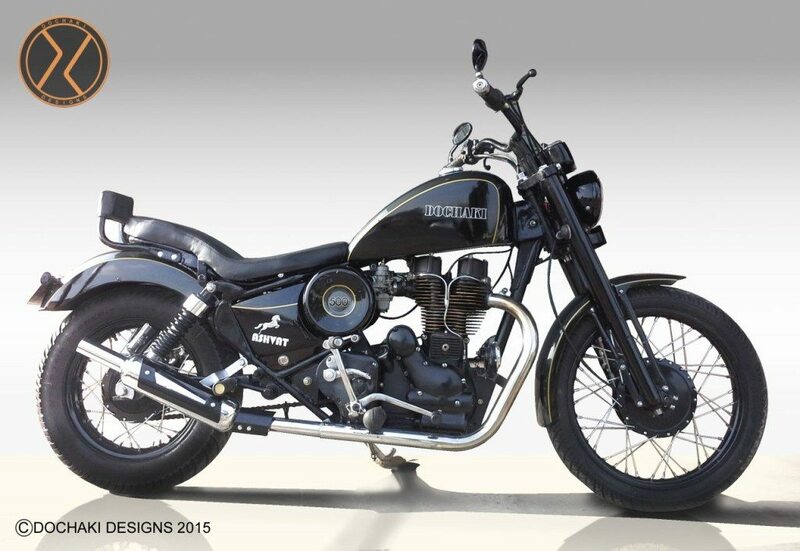 This motorcycle is a visual as well as mechanical upgrade of the Royal Enfield Lightning. Visually, the Ashvat receives a plethora of hand crafted parts such as a lean patrol tank, side panels, new round shape, air filter and battery cover, new seat pan, new front shock absorber mountings, *breathe in* custom made handle with bar-end mirrors, custom made meter mounting box, smaller yet powerful headlamp, LED brake lights and blinkers, customised frame to accommodate low seat height, a new swing arm, updated chain arrangement and a small back support at the rear for pillion comfort. The overall length of the vehicle is increased by 4 inches. The major part of the motorcycle has been wrapped in black along with grey on the sides while golden strips highlight the details and keep away a monotonous paint job feel. 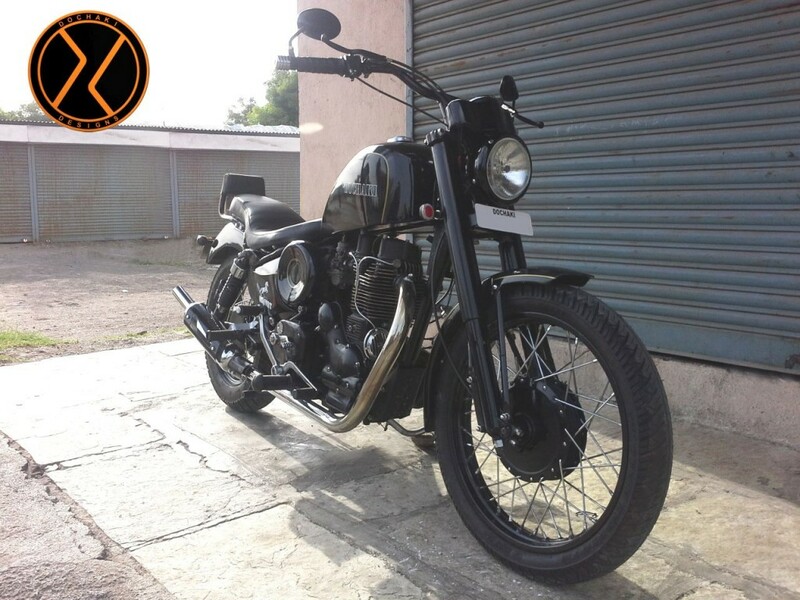 We wouldn’t say that this is a phenomenal mod-job but it is a good attempt to revive an old motorcycle. The golden highlights on the front fender, fuel tank and side panels may not be as precise as the ones that come out from the Royal Enfield factory, but these falws and niggles aren’t noticeable to everyone but the eagle-eyed enthusiast. The motorcycle also receives some mechanical mods to increase the power output, although by a teeny-weeny margin. People responsible for the Ashvat did not have proper equipment to record a precise power output but they have confirmed to us that the motorcycle has a cognizable increased power output, although not by a great margin. Factors contributing to this increase in power output are some modifications to the piston, engine block and head. Dochaki have kept the original filter on the Ashvat but added some extra openings for extra air flow. Dochaki has surprised us with some really good mod jobs but the Ashvat seems like a product that wouldn’t leave its mark in the now highly competitive custom built motorcycle market and would be lost in the long list of options already available with time. But that’s just our opinion. What are your views? Share your thoughts with us and fellow readers through the comments section below.